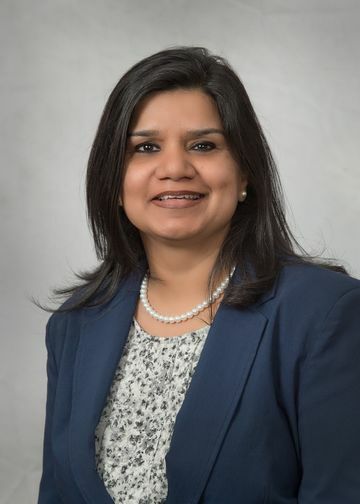 Dr. Veena John is a board certified Hematologist/Oncologist. She has worked for Northwell Health for the last 15 years and specializes in Gynecologic Oncology and breast cancer. She is also the co-chair for the CSSRC. Dr. John is the principal investigator for Gynecologic Oncology Group clinical trials and multiple pharma studies. She cochairs the Gynecologic Cancer Center of Excellence and she is the chair for gynecologic disease team. She is responsible for teaching the fellows and is involved in running the fellows clinic. She is also involved in the genetics program at Monter Cancer Center. Dr. Veena John’s main research focus is on Gyn cancer, especially ovarian cancer. She is the principal investigator for multiple phase II and phase III studies. Her main focus is on finding better treatment for ovarian cancer and also prevention and early detection. Myra F Barginear, Veena John, and Daniel R Budman “Trastuzumab-DM1: A Clinical Update of the Novel Antibody-Drug Conjugate for HER2-Overexpressing Breast Cancer.” Mol Med. 2013 Jan 22; 18:1473-9. doi: 10.2119/molmed.2012.00302. Veena John; Sandeep Mashru; Stuart M Lichtman “Pharmacological factors influencing anticancer drug selection in the elderly.” Drugs & aging 2003;20(10):737-59. Budman DR, Tai J, Calabro A, John V: “The histone deacetylase inhibitor panobinostat demonstrates marked synergy with conventional chemotherapeutic agents in human ovarian cancer cell lines.” Invest New Drugs. 2011 Dec;29(6):1224-9. doi: 10.1007/s10637-010-9467-6.Epub 2010 Jun 9.